Yahoo shares started to tumble yesterday amidst rumors that the tech company would be making significant layoffs starting in December. Some initial rumors were that Yahoo would be laying off 20% of its staff. However, that number was rebutted with a correction to around 10%. Regardless of the where the exact number comes in at, Yahoo shares (NASDAQ:YHOO) started to take a dive yesterday as the news hit the wires. 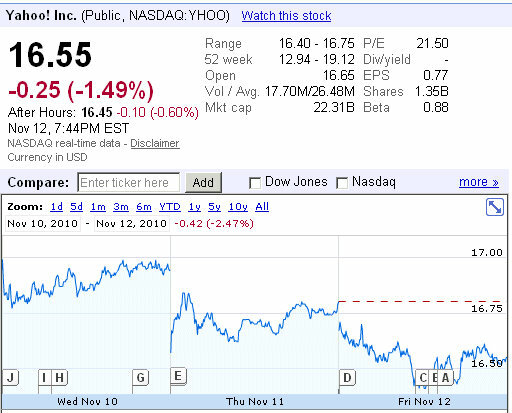 Yahoo shares are closed yesterday at -0.25 (-1.49%) at 16.55. With Google dominating the search landscape, and Facebook seemingly dominating the content landscape, Yahoo has a real problem on their hands. If everyone is search on Google and consuming content on Facebook, there where exactly does Yahoo fit in? Perhaps Yahoo needs to find ways to leverage the Facebook API and integrate more directly with Facebook.